A Limited Edition fine art print by Peter Deighan. 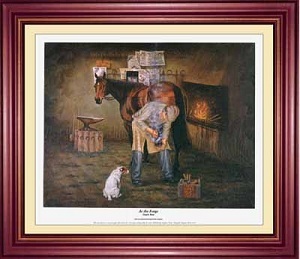 You can almost feel the heat and smell the forge in this study of the smithy at work, a truly evocative print. "At The Forge - Dawn Run" feature the magnificent mare, the winner of both the Champion Hurdle and the Cheltenham Gold Cup. Published in a limited edition of only 350, the image measures 485x385mm and is personally signed by the artist. Please note, our price is for the unframed, limited edition print.